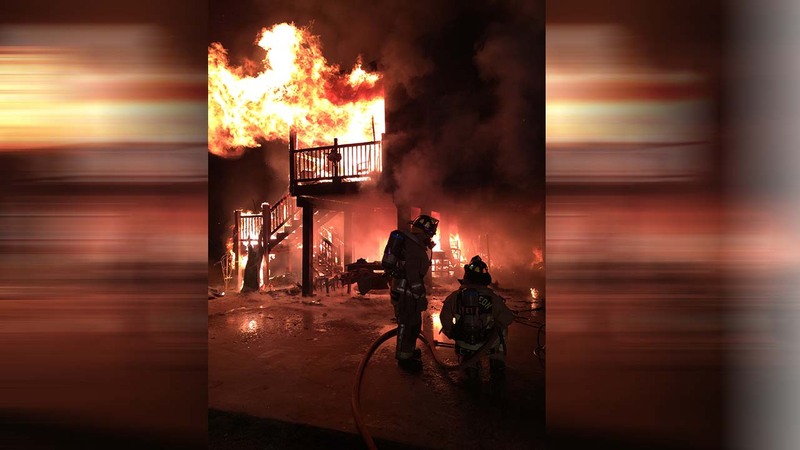 SAN LEON, TX (KTRK) -- A house fire in San Leon almost took a tragic turn Thursday when an oil and gas explosion rocked a burning home with two firefighters trapped on the second level. The San Leon Volunteer Fire Department says they responded to the fire in the 500 block of 8th Street around 8:30pm. That's when the captain and another firefighter began tackling the blaze on the home's second-story deck. Suddenly, according to the fire department, an explosion rocked the house. Firefighters believe the explosion was caused by a drum of oil and gasoline stored underneath the house. The firefighters on the upper deck became engulfed and others rushed to their aid, fighting back the flames so they could safely escape. No one was hurt in the fire. The crew reports they just had some scorched gear.